Decorating for the holidays is so much fun. There’s no words to truly describe the feeling you get when your house is all decorated and twinkling. Without this little basket, you’re not truly done decorating. Luckily, you can get everything you need to make it at the dollar store! YouTuber KraftsbyKatelyn came up with this DIY, and I can’t thank her enough… it’s so easy! First, take your pencil organizer and hot glue rope all around it. Hot glue burlap ribbon on the top, and the basket to hold the rest of your items is done. 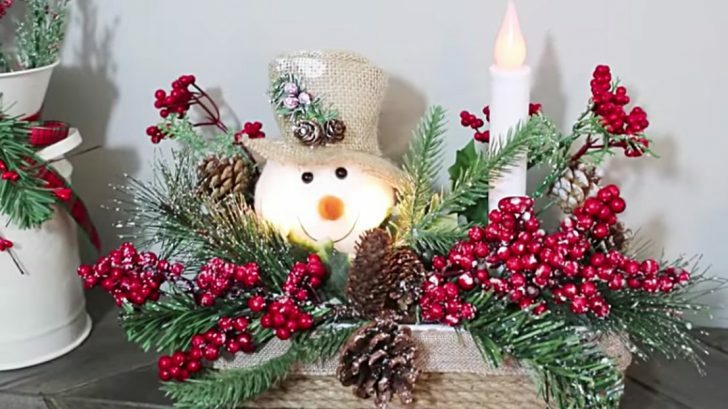 Glue down your styrofoam ball (you’ll put your ornament on top of this), and LED candle wherever you’d like, then arrange your fake berries, pinecones, and so on. Glue all of this down, add your ornament on top of the styrofoam ball, and your little centerpiece is done! So cute and easy, and beyond cheap, too! Check out KraftsbyKatelyn‘s video below to make your own, and happy holidays!